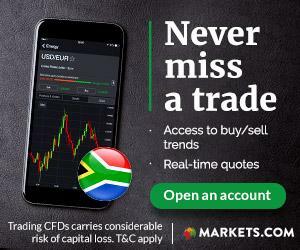 Markets Broker, a South African FSB regulated Forex Broker, offers a great ZAR 250 ($25) Bonus to all its new clients from South Africa for account registration. The traders can use the bonus amount for 3 months to trade and earn a profit! The eligible clients are required to sign up for a trading account at the broker in order to receive the free funds. The bonus amount and the earned profits will become withdrawable after meeting the required trading conditions - at least 10000 ZAR trading volume for every ZAR that you receive which is, in this case, will be 2,500,000 ZAR - and making a deposit. Bear in mind that for a withdrawal request you need to provide a legitimate identification document such as a passport, a national id or a driver’s license in addition to a utility bill or a bank statement for proof of address. Simply become a member of the broker by open a trading account (complete the verification process), receive the bonus in the amount of $25 automatically, and begin your trading experience as well as making profits. The bonus offer is applied once per client, and multiple account participation is not allowed. Premature withdrawal requests will result in bonus cancellation. Account inactivity nullifies the bonus. Get Markets 250 ZAR Bonus Now!